There are an estimated 880 trillion gallons of brackish water underneath the state's surface. But using the salty resource can be tricky: Treating it carries a hefty price tag, and the oversight of its withdrawal isn't clear-cut. With an exploding population and a dwindling surface water supply that is increasingly out of reach, Texans are counting on water below the ground to fuel the state's economic growth. 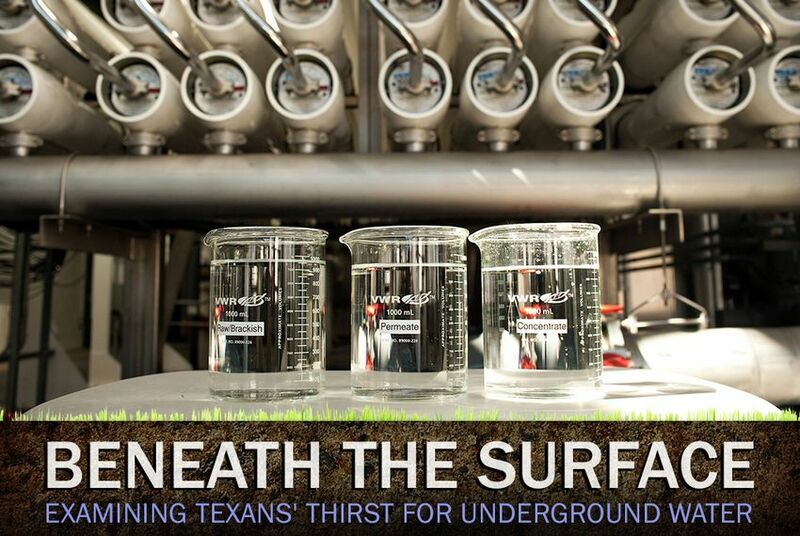 But they face significant challenges, examined in this series on the state's thirst for underground water. Hundreds of trillions of gallons of brackish water are estimated to lie underneath Texas, an amount that some believe could quench the state’s thirst once and for all. There are just a few problems with the water: It has too much salt and other dissolved solids to be fit to drink, treating it carries a significant expense, and regulating its withdrawal — like with all Texas groundwater — has already proved to be tricky. While the aquifers in Texas thus far generally are pumped for the freshwater, most also contain a significant amount of brackish water, often in a different layer of the aquifer formation. Few dispute that mass-scale treatment of such brackish water, through a technique known as desalination, would go a long way toward solving Texas’ water problem. Some, including Dow Chemical in Freeport, have taken advantage of desalinating nearby seawater, but the more practical option for most public water systems is to extract brackish water from underground. That resource is not as salty as seawater and therefore less expensive to treat. Yet questions remain on accessing and using the estimated 880 trillion gallons of brackish water underneath the state's surface. State law requires that groundwater conservation districts develop goals for the aquifers they regulate, to make sure they’re not depleted by overpumping. But that rule only exists explicitly for freshwater underground. Fraser said that whether districts should treat brackish groundwater and freshwater the same is an open question, even though the brackish water is much more abundant. “Is there a reason to try to preserve it, make it last?” he said. In addition, concerns that pumping from an aquifer's brackish water layers could cause that water to mix with freshwater run high in many parts of Texas. “It’s not like we have this one separate bathtub of brackish groundwater and this one separate bathtub of freshwater,” said Stacey Steinbach, executive director of the Texas Alliance of Groundwater Districts. In some aquifers, brackish and freshwater supplies may exist on separate levels that are unlikely to mix. In others, they could flow together at the same level. “You pump the brackish, it’s definitely going to have an impact on the fresh” in some areas, said Robert Mace, deputy executive administrator at the Texas Water Development Board. Nearer to the Gulf Coast, the effects could be severe because both types of water flow in the same layer or layers that are very close to one another. But in other aquifers, the situation is different. The TWDB has identified the Carrizo-Wilcox Aquifer as one with the most potential for producing brackish groundwater. In that aquifer, brackish and freshwater layers are hundreds of feet apart. “When you pump that deeper brackish [water], the effects have to get all the way through that shale and clay before it affects the fresh" water, Mace said. But the Evergreen Underground Water Conservation District in South Texas, one of many districts that regulates the Carrizo-Wilcox, feels differently. San Antonio Water System had hoped to tap into brackish groundwater within the Evergreen district, but its plans were stymied by warnings that the district could shut down pumping at its discretion if any concerns arose that the activities could affect the aquifer's freshwater supply. The district's rule could have caused “hundreds of millions of dollars of infrastructure [to] just shut down basically overnight,” said Steve Kosub, a lawyer for the San Antonio Water System. “[Brackish groundwater] is a different resource from freshwater, and it warrants treatment in a different way.” SAWS had to instead to pump brackish groundwater from Southern Bexar County, where no groundwater conservation district exists. To add to the difficulty on the issue, there’s still no scientific consensus on exactly how much brackish groundwater exists in Texas and where it is. It’s not even clear how to define “brackish.” Several state lawmakers introduced legislation in the 2013 session that would codify brackish water as any water with a level of Total Dissolved Solids, or TDS — which includes minerals, salts and metals — between 1,000 and 10,000 milligrams per liter. (Seawater, by contrast, typically has a TDS level that is higher than 35,000 milligrams per liter). Not everyone agrees with such a definition. Steinbach said a large proportion of aquifer water that is considered “freshwater” by districts has a TDS level higher than 1,000. If that suddenly became known as brackish groundwater, and legislators allowed for it to be regulated far less strictly, there may be consequences. “Do we lose our ability to really protect this water from contamination? Whether it’s 900 or 1100 [milligrams per liter], it’s still valuable drinking water,” Steinbach said. Because none of the key bills related to brackish groundwater passed in 2013, the definition is still up for debate. There also continue to be efforts, all of which failed in 2013, to allocate more money for studying the amount and location of the resource in the state, the potential consequences of its extraction on the underground freshwater supply, and the feasibility of large-scale desalination, an expensive proposition. Only a few dozen desalination plants exist in Texas today, and most are small. The method requires far more electricity than conventional freshwater treatment, and desalination facilities must also dispose of huge amounts of salty waste — sometimes by injecting it underground, just as many oil and gas drillers dispose of their own wastewater. But whatever the environmental or economic costs, many stakeholders still believe that the benefits far outweigh the cost and that brackish groundwater extraction and desalination plants will become the norm in the coming decades. “These are huge, huge supplies of water,” Kosub said. If pumping brackish groundwater is proven to affect some freshwater supplies, he said, there are ways to contain the problem, such as treating the contaminated water on a large scale; ceasing any extraction of brackish groundwater isn't a solution.